We specialize in creating beautiful spaces for busy professionals by providing interior styling solutions at a comfortable price point. With the renewal of urban cities such as Washington, DC, Dallas and Charlotte and the changing landscape of suburbs becoming more dense, there is an increasing desire to bring the “art of urban design” to residences. Home projects can be a beast to handle. Where blown budgets, to delayed shipments to poor communication can be common place. We have a team of reliable contractors and vendors in place to give you a better experience for your home decorating, staging and/or remodeling needs that cut the frustration. Our design process can help if you struggle with a challenging floor plan to maximize space or furniture selection and arrangement for the ultimate entertainment experience or a color scheme that represents you and complements your space. 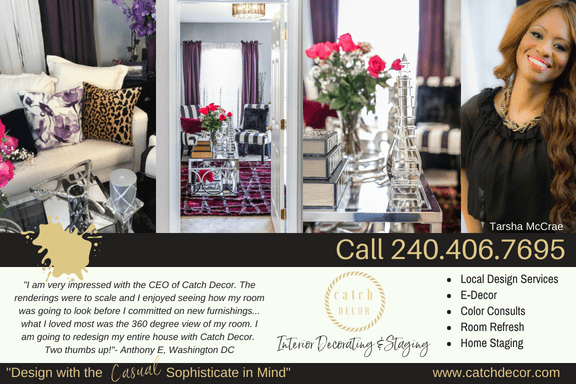 Catch Decor provides local in-person design as well as E-decor services. E-decor involves the use of online consultations, and project management resources to facilitate real-time communication, collaboration, idea sharing and organization for your home styling needs. If you prefer to see and touch materials, we will send samples and swatches and shop items at stores near you. So no matter your preference or where you are in your home styling process you should find E-decor an excellent tool to meet your design needs. Tarsha McCrae… Interior creative inspired by imaginative art, jet-setting experiences and high-end couture. My style can be described as elegant and contemporary comfort chic for casual sophisticates. I love bold color design and sophisticated neutrals with an infusion of color. I possess a unique take on combining elements from different styles for a fun, lively and casual space. Catch Decor works to make your home not only visually appealing with all the attractive details but comfortable and practical as well. I’m attracted to styles such as Hollywood regency, new traditional, rustic farmhouse with a chic twist, casual coastal and modern eclectic. I’m a globe-trotter at heart so love working with those that are well-traveled. I look forward to chatting and swapping travel stories! So let’s get ready to fill your home with character, love and style! So what’s your next home project? Contact me so I can help!